Lawn Care, Landscaping, and More! Our services have been crafted to ensure your home or business looks perfect all year round. Be it clean up or routine maintenance, leave it to us to get the job done right. 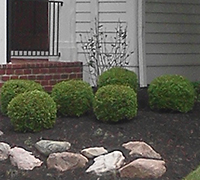 A Kut Above listens closely to your landscaping needs, desires, maintenance preferences. This allows us to understand your personal likes and dislikes to customize your project to you as an individual. An assessment of your property will allow us to determine sunlight variances, drainage issues and any areas with special needs that may pertain to your project. This thorough planning allows us to ensure the best installation at the most efficient cost. During installation, only the finest materials will be used and our attention to detail creates a high quality finished product. We strive to complete your project on time and on budget. The project is complete only when you are completely satisfied. Additionally, we encourage open communication through the life of the project to make sure your expectations are being met. 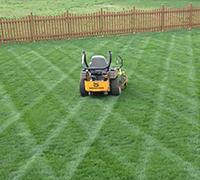 Mowing your grass has more benefits than improving the aesthetic of your home or business. It also increases the health and resilience of your turf, prevents weeds and allows more moisture to reach the soil. 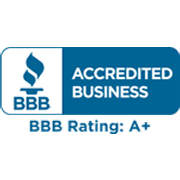 Our courteous crew is trained to ensure your lawn has a clean, professional appearance. By adjusting mowing heights based on seasonal weather conditions we are able to maximize the life of a single mow. Grass clippings are removed from driveways, curbsides, sidewalks and outdoor living spaces following each mowing. Core aeration is one of the most valuable services A Kut Above can provide for your lawn. With this service, we’ll use an aerator to remove cores or plugs of soil across your lawn to help break up the thatch layer which can block water, valuable nutrients and provides a home for insects and disease. Aeration and overseeding work well when done together. So, this may be a great time to consider overseeding your lawn if you are looking for thicker, more lush grass. It is usually done in the Fall, between September and November, weather permitting. 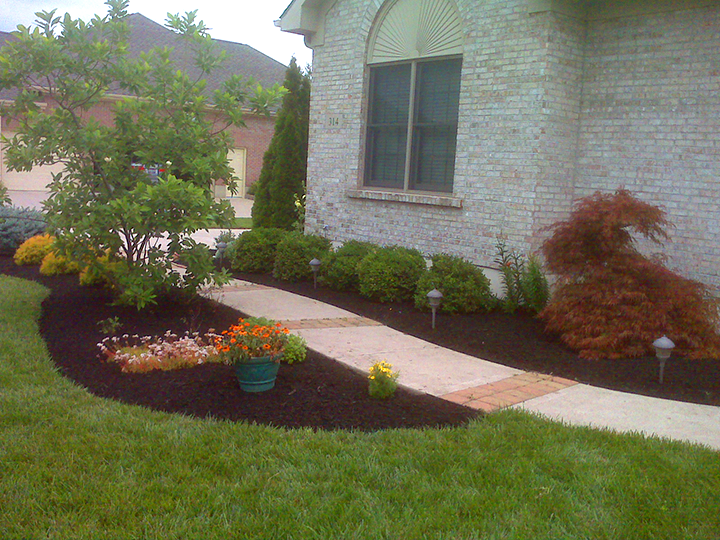 When it comes to a healthy, successful landscape, mulching is essential. Add a crisp, well-cared for look to your home or business while the mulch works daily to provide added benefits. Improve the appearance of your lawn. Keeps soil warmer in the winter and cooler in the summer. Helps maintain soil moisture reducing the need for watering. 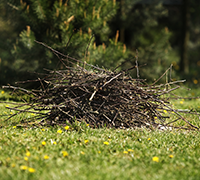 Mulching around trees can reduce the likelihood of damage from “weed whackers”. Professional pruning services enhance the natural beauty of your landscaping beds and improves the health of your shrubs and flowering plants. Plus, with A Kut Above, your property can have a sculpted well manicured look and you don’t have to worry about the cleanup! In early spring, the Ohio region is prone to morning frosts that could endanger new plants. We recommend using the first few weeks of Spring to clean up your lawn, landscape beds, walkways and driveway. Our cleanup service removes leaves, sticks, paper, debris, winter kill and old annuals leaving you ready to face the growing season. Plus, routine cleanup reduces the chance of fungus or disease affecting your valuable plants. Ohio winters are hard on turf and plants. 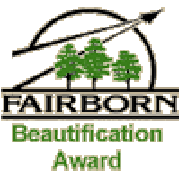 Weather permitting, we encourage Fall cleanup be completed between October and December. 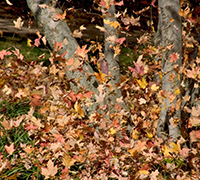 Removing leaves, sticks, paper and debris will help prevent disease and fungus from affecting your turf and plants. Additionally, A Kut Above will remove any perennials and annuals from your planting beds, leaving you to enjoy the fall colors knowing your lawn and landscaping beds are happy, healthy and ready for winter! For our commercial customers, we understand the winter elements can be hard to handle.. Let us handle the snow so you can go back to what you do best. A Kut Above will keep your parking lots and walkways clear. All snow removal is completed within a reasonable time frame to maximize convenience for you, our customer.